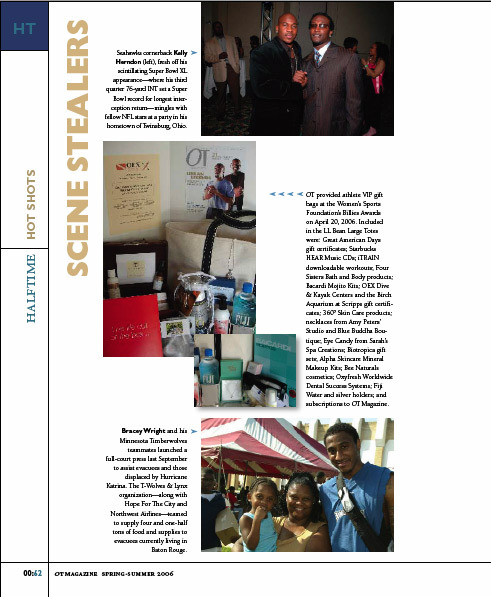 Blue Buddha Boutique owner and founder Rebeca Mojica was honored to appear in the Most Inspiring Stories: Hollywood section of VoyageLA Magazine. 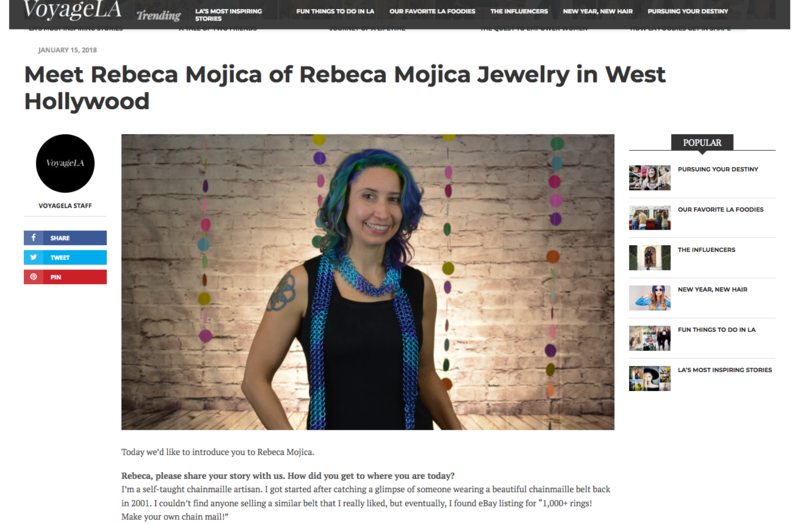 Read the full in-depth article to find out more about all three of her business endeavors: Blue Buddha Boutique, Rebeca Mojica Jewelry and Linkt Craft Kits. This edition has an exciting new project from Rebeca Mojica. Check out our Braided Ladder kits. 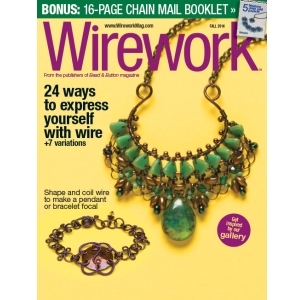 This issue has a 16 page chainmaille booklet. 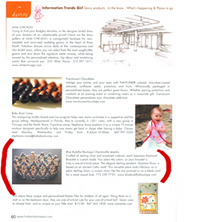 It also includes two projects from B3 designers. Learn to create Rebeca's "Gaelic Rose Pendant" and Kat's "Spinal Column" bracelet using our complimenting kits. 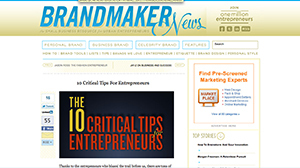 This article features an interview with Rebeca Mojica about how to make the most of an entrepreneurial retreat. "A Breath of Fresh Air: 5 Reasons a Retreat is Good For Your Business" by by Sophia Dembling. 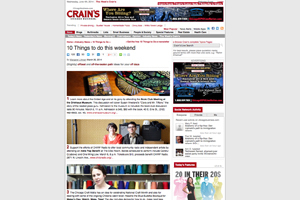 Maker's Day—a free event organized by the Chicago Craft Mafia and Blue Buddha Boutique; is #3 on Crain's Chicago Business list of Top "10 Things To Do This Weekend." The event is open to the public and features crafty demonstrations and free make-and-takes. 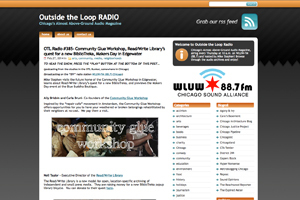 Maker's Day—an event organized by the Chicago Craft Mafia and Blue Buddha Boutique; is included in this podcast. Rebeca Mojica is interviewed about the March 8 event, which is open to the public. For a recap of the event, check out the Chicago's Maker's Day video on YouTube. 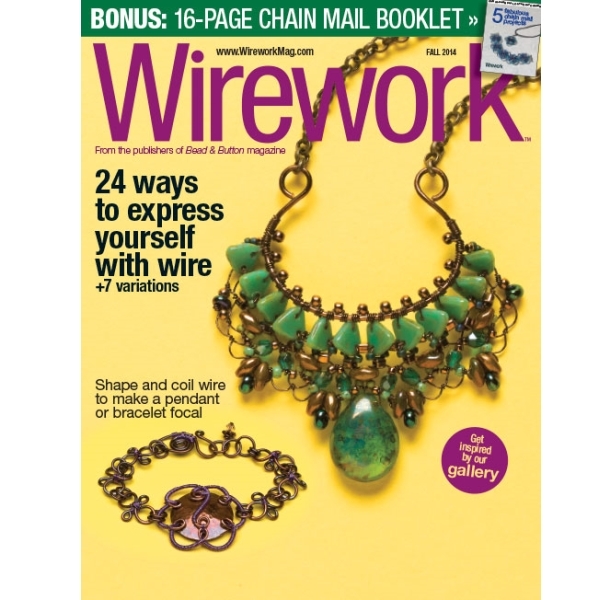 The dramatic yet easy-to-make Elemental Leaves necklace appears in this issue. 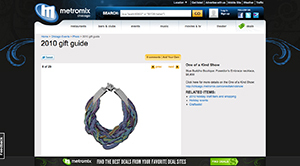 The necklace is a design by Rebeca Mojica and uses anodized aluminum jump rings and "scale" components from Blue Buddha Boutique. 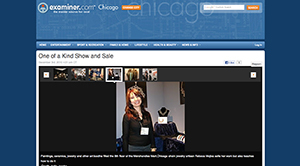 The Grand Opening Party for Blue Buddha Boutique's retail store in Chicago is featured in this week's Chicago startup roundup. 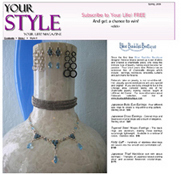 Blue Buddha founder Rebeca Mojica shares her knowledge about teaching jewelry-making classes in a craft store. 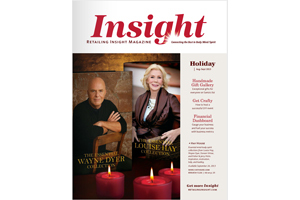 Blue Buddha Boutique's retail store, classrooms and education philosophy are featured in this issue. 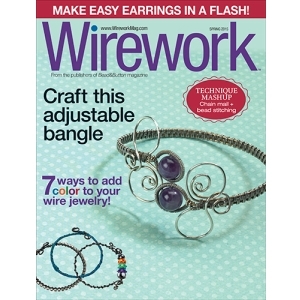 The dramatic yet easy-to-make Zeela, a colorful chain mail bracelet by B3 founder Rebeca Mojica, appears in this issue of Wirework magazine and is featured on the cover. The piece appears under the title "On The Edge". Rebeca is featured as one of "5 People Who Turned $1,000 Into $1 Million". 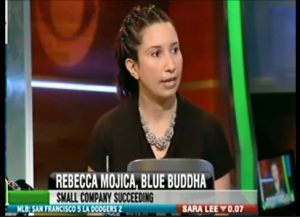 Rebeca talks about her choice to create and utilize an advisory board for her small business. 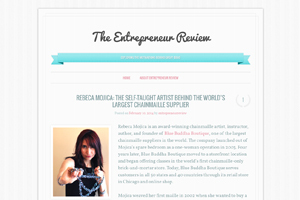 Rebeca talks about how she got into chainmailling, discussing using different metals and admits she's a perfectionist — *wink*. 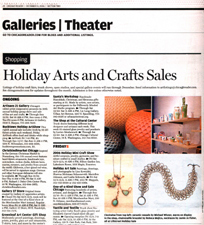 A great review of CHAINED can be found on pg 12 of this issue. "The beautifully detailed images make it easy to skim the text and still successfully complete the project. Mojica's use of richly colored rings not only enhances the weaves but inspire readers to test and expand their own color palette....With a healthy dose of history and how-to, this is a great book to add to your library, especially if you're just starting out in chainmaille or want to build a solid chainmaille skill set." 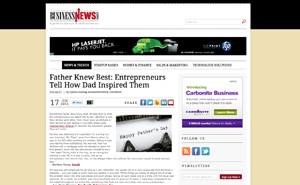 Rebeca is featured in this Father's Day article all about Entrepreneurs who were inspired by their dads. "The fact that someone could start with nothing and wind up owning property and starting their own business.... Well, isn't that what this country is all about?" Blue Buddha is featured in the article "Staff without payroll - What your business needs to know about volunteers and paying in barter". The article features Blue Buddha's short-term employment bartering program which allows people to choose to be paid in Blue Buddha products over an hourly rate. 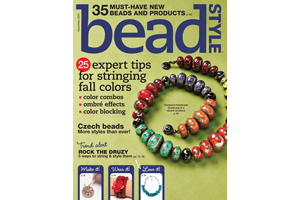 Our Anodized Niobium toggles are featured in the Steampunk section of Beads on Trend. 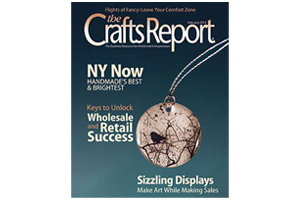 Blue Buddha is featured in the article "When Business is Too Good" which examines what happens when craft businesses grow more quickly than expected. 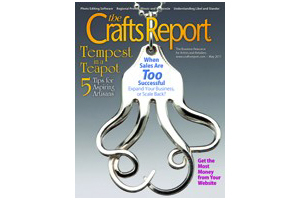 "Experienced crafters know that there's more to success than being good at one's craft; it also means being good at one's business..."
A review of Chained is included on page 62 of this magazine. 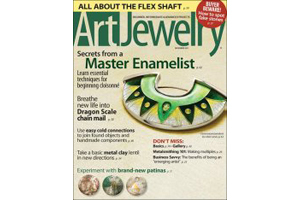 Reviewer Sara Richardson concludes, "If you've been resisting making chainmaille pieces, Chained will definitely convince you to break out of your shell and try it. 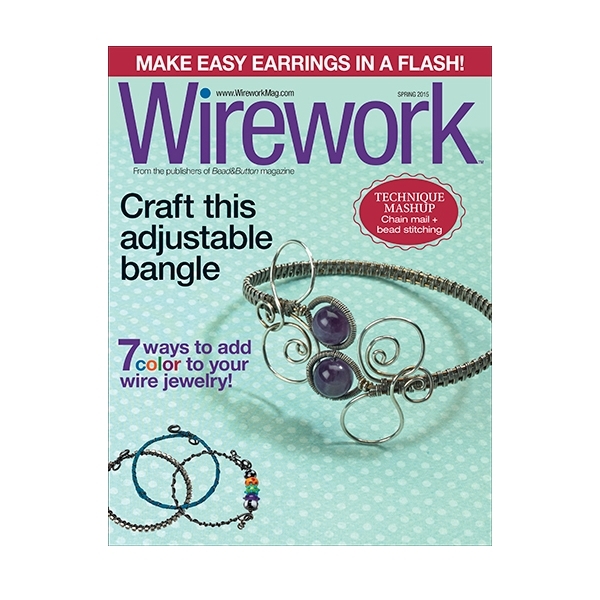 Go on, break out your pliers and make this beautiful jewelry!" 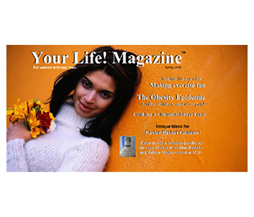 Rebeca's first international publication! Read more and take a look inside on our blog. 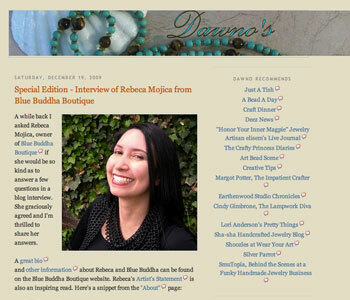 Rebeca's journalism Alma Mater interviews her about Blue Buddha's roots and continued growth despite the recession. 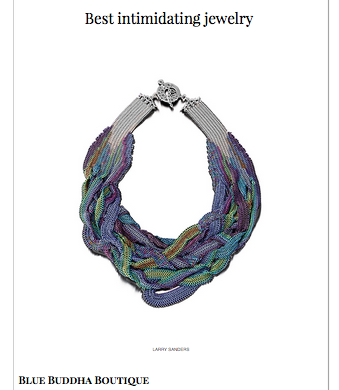 Also features quotes from long-time Blue Buddha customer, Linda Johnson. 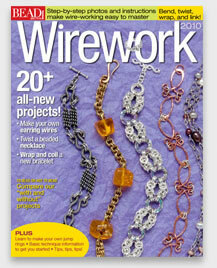 Rebeca's chainmaille Snowflake is featured on the cover of this issue. 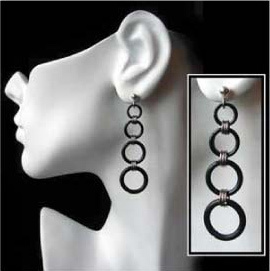 Follow her step-by-step instructions to create this project in a variety of metals. Snowflake kits are also available for sale in our supplies section. 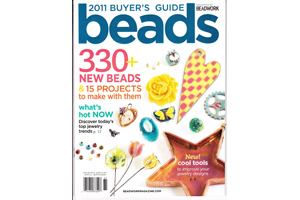 You can find out more about this issue's projects on our Magazine Supply List page. 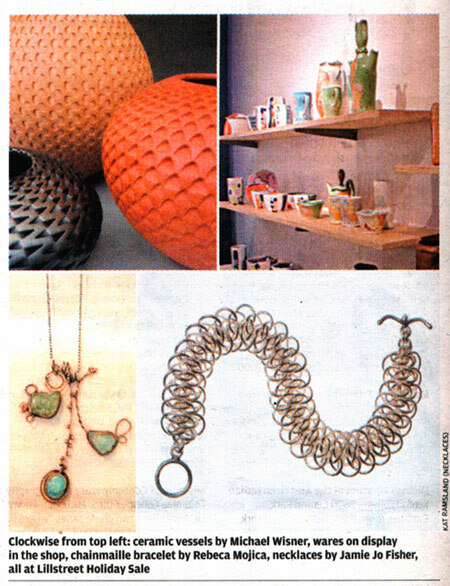 Rebeca's Poseidon's Embrace necklace was featured at the "One of a Kind" Art & Craft Show at the Merchandise Mart. It is photo # 8 of 29 in the slide show at MetroMix. 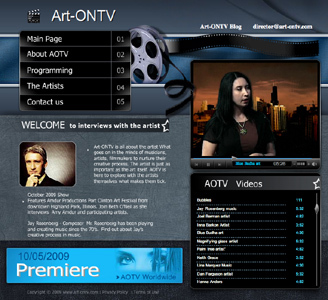 This item was also the featured art work on the show's signature shopping bags. Rebeca Mojica, owner of Blue Buddha Boutique, is the model for the article "Creating Successful Company Cultures" by Jackie Sloane. 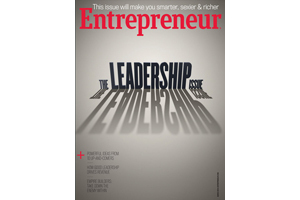 Rebeca "...focused on the enterprise she hoped to lead, including the culture she wanted...."
This article first appeared in the Chicago Tribune under the title Small Businesses have Flexibility to Make Big Changes. Rebeca made a guest appearance on this CBS show as an example of a small business thriving in challenging economic times. Blue Buddha Boutique is one of two companies featured in this article about what has helped some companies grow—and indeed, thrive—in recent years. 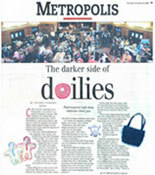 The in-print version of the article featured a full-color photo of Rebeca. 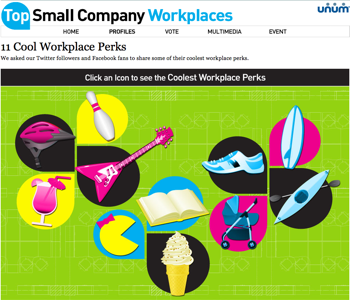 Blue Buddha Boutique is honored to appear on Inc.com in this interactive feature about Cool Workplace Perks. We’re thrilled to be among such good company! 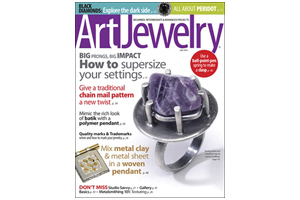 Rebeca's Crystal Ring Byzantine is featured on the cover of this annual publication. Follow her step-by-step instructions to create this impressive beginner project. Crystal Ring Byzantine kits are also available for sale in our supplies section. An in-depth interview with Rebeca. 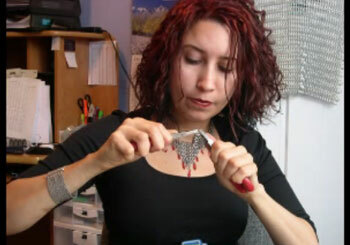 Find out what she likes best about teaching chainmaille, what she recommends for beginners, and how she transitioned from working for others to owning her own business. Find out how her obsession with fractals and the universe influences her creations. 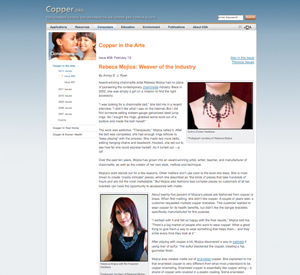 Rebeca Mojica was interviewed for an article about colored jump rings, including anodized aluminum, enameled copper and anodized niobium. Additionally, Blue Buddha jump rings were used for the Palau Reef Set by Charlene Anderson. 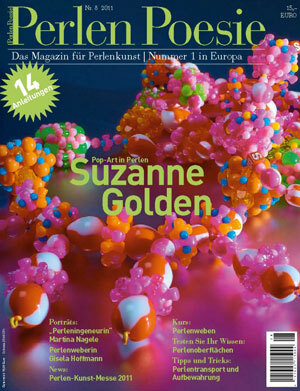 You can find out more about this issue's projects on our Magazine Supply List page. 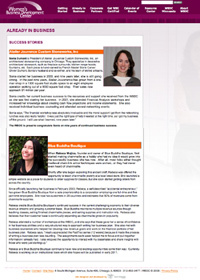 Rebeca Mojica is featured as one of the success stories on the Women's Business Development Center's website. Verbal communications is crucial to entrepreneurial success, and small businesses are no exception. 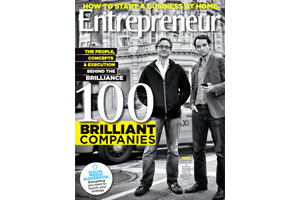 This article explores the importance of good presention and voice skills in today's business world. 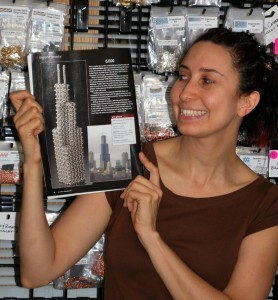 Blue Buddha Boutique's Rebeca Mojica is quoted, and the article features a photograph of her working on the Sears Tower sculpture. 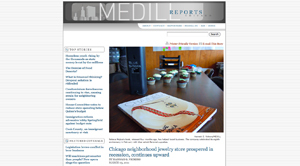 Quantum Rose Pendant as seen in Chicago Journal, the newspaper of Chicago's South Loop, Near West and West Loop neighborhoods. "... As much as I love decorating my apartment, I love decorating myself even more. done by Chi-town designers [at Razor's Edge Boutique] ... "
Also mentioned: Quantum Rose Pendant. 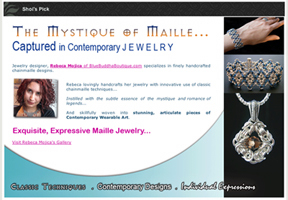 There are also several new workshops in Chain Maille with Rebeca Mojica. Check out her beautiful work in silver, gold and aluminum currently on view in the gallery. You'll be inspired!